Interference Archive | Limited Edition 7″ Release & Exhibition Closing Party! Limited Edition 7″ Release & Exhibition Closing Party! We’ve got two things to celebrate! if a song could be freedom . . . Organized Sounds of Resistance has had a great run, but is closing on Sept. 6th, so this will be one of the last chances to see it! 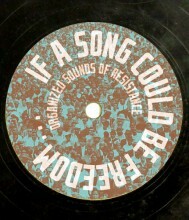 In addition, we pressed a limited edition 7” vinyl record in collaboration with Textual Records to go with the show!! We’ve been hard at work on it for months, and we’ll finally be releasing it tonight. Pre-order your copy now! Come on out and celebrate the release of the record and the closing of if a song could be freedom… with a party! If you pre-ordered a record you can pick up your copy, and everyone else will be able to purchase one at the event. There will be beer, socializing, and, of course, music.